No Bootcamp Monday 27 May, it's Bank Holiday weekend and the third Hebden Bridge Blues Festival, Fri - Sun so I'm hanging up my gloves for a day off and hope to see some of you at the festival find out more. 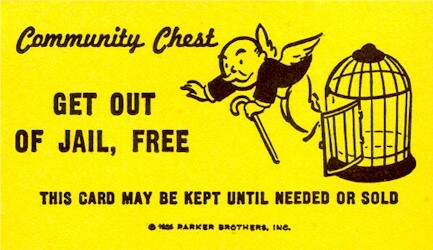 This is your 'Get out of Jail Free' card so use it wisely and come back fresh for Circuits on Tuesday 28 May. Classes as usual this week; Women's Fitness Wed 10.30am, Wednesday Warriors 6.15pm, Boxercise (with less-evil-than-me-Guest Instructor, Mish) Fri 9.30am, Women's Training, Sat 11am. No Juniors Training this Saturday 25 May - back to normal next week. See you in the gym.